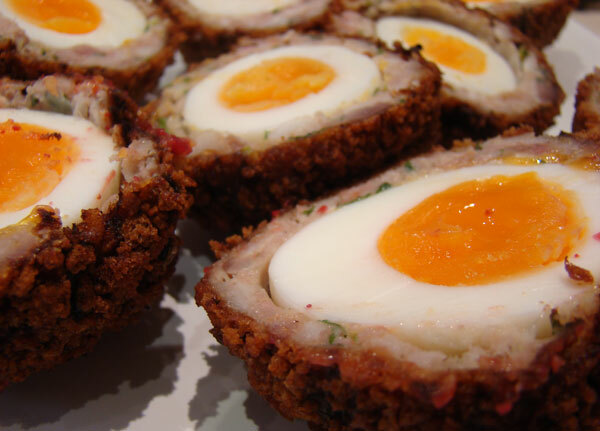 Everyone loves a good Scotch egg at the pub. Well they certainly do in London anyway. Never afraid of a challenge I decided I was going to give this British tradition a good old Aussie go! To be honest I was actually quite nervous. It looked to me to be a sure recipe for failure. But HAZZAH! It was an astounding success. Although rather time-consuming, they are easy to make and are sure to impress. I made both the traditional pork variety and a veggie, which controversially I actually think was the better of the two. The colouring from the beetroot made them look quite stunning. Carefully place the eggs in the boiling water and boil for exactly 7 minutes. Drain and cool the eggs in a bowl of cold running water, then peel. Mix the sausage meat with the thyme, parsley and spring onion in a bowl and season well with salt and freshly ground black pepper. Place the seasoned flour onto a plate, then roll each boiled egg in the flour. Wrap the sausage meat around each egg. Make sure the coating is smooth and completely covers each egg. Carefully place each scotch egg into the hot oil with a slotted spoon and deep-fry for 6-8 minutes, until golden and crisp. Serve cool with English mustard or chilli jam. Heat the oil and butter in a frying pan. When the butter is foaming add the onion, carrot, garlic and chilli flakes and fry until the onion is softened. Place the chickpea purée into a bowl. Add the fried ingredients and mix well. Add the beetroot and thyme and season very well with salt and freshly ground pepper. Roll the eggs in the flour. Wrap the chickpea mixture around each of the boiled eggs, making sure there are no gaps and mould into balls. 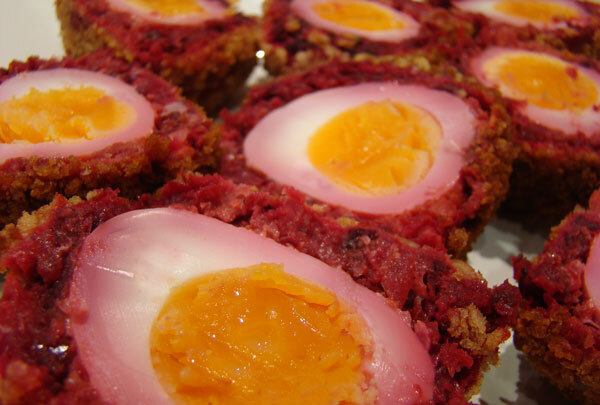 Roll the coated eggs in the beaten egg, then roll in the breadcrumbs to coat completely. Carefully add the coated eggs to the hot oil and deep-fry for 2-3 minutes, or until crisp and golden-brown. Remove with a slotted spoon and drain on kitchen paper. Serve cold with English mustard or chilli jam.